I searched and searched and I couldn't find a bad word written about Colin Thubron anywhere. One of the best travel writers in the world, says Jan Morris. One of the top fifty post-war British writers according to The Times. Whoever mentions him, does so with praise and awe. Why, then, did his To a Mountain in Tibet leave me totally uninspired? I AM disappointed, you know. All the applause had seriously whetted my appetite. To a Mountain in Tibet tells a story of something akin to a secular pilgrimage. 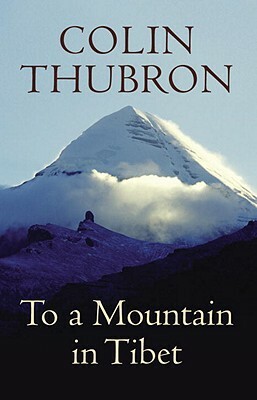 Mount Kailas is sacred to multitudes and while Thubron does not appear particularly dogmatic, he is on a personal spiritual journey. Snapshots from family life are mixed with tidbits from Tibetan folklore and politics. He meets with lamas and visits poor village dwellings, deals with Chinese officials and explores local myths. It's not that the book is bad, or stupid, or vulgar or anything like that. Thubron's grasp of English is masterly. He takes words like 'rumbustious', 'abstruse', 'circumambulate', 'equidistant', 'coeval' and weaves them into a smooth narrative. His descriptions are poetic, his research thorough. Still, how much can you squeeze out of a short trip to the mountains? I'm convinced that To a Mountain in Tibet is not the best book to start an acquaintance with Colin Thubron. It's fairly decent as far as travel writing titles go, but not exceptional, not life-changing, not mind-blowing. I'm going to give him another chance (review coming soon), but so far I'm not willing to join the crown of his admirers.